← Winding sticks? We don’t need no stinkin’ winding sticks! On woodworking forums and blogs, I run across questions like these a lot. If you ask a successful professional, you will get a pretty standard series of calculations that take into account raw materials, production costs, insurance premiums, and a host of other factors to arrive at prices that maintain a satisfactory profit margin. Such calculations are essential for a professional or semi-professional woodworker, but what about the hobbyist who sells only a few small pieces each year? The discussions that professional craftspeople have with each other about shop rates, overhead, and markups are very important, but most of those factors are irrelevant to hobbyists working out of their home shops. I found myself in this position a couple years ago. 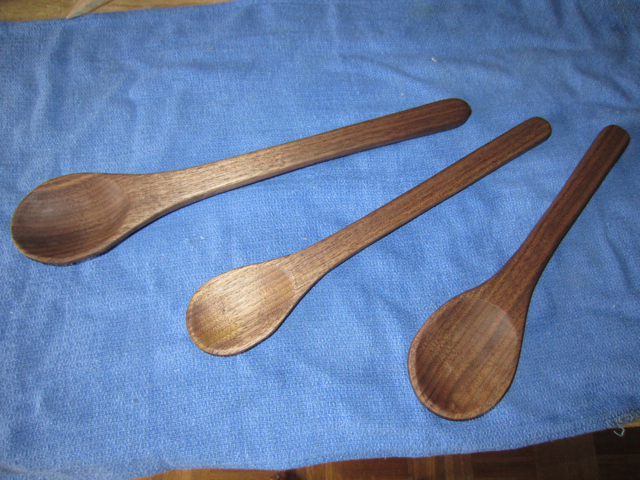 I’ve had been doing spoon carving and other woodwork as a hobby for several years. I had done it and still do it primarily for myself and my family–plus, when I need to attend a wedding or a housewarming party, a set of handmade wooden spoons makes an excellent gift. It costs me little more than time and a chunk of wood from the scrap bin. But when I first began to sell my work, I couldn’t make any of the Business 101 calculations work for me. I wasn’t trying to make a living on my woodwork. My shop costs, such as water and electricity, are the same as my housing costs. Many of my materials are picked up for free on the side of the road. Wear-and-tear on my tools is so small as to be unmeasurable. After reading through a lot of forum threads and blogs on the topic, I had to step back from the conversations between the pros and think about what I wanted to get out of my woodwork. First, I wanted to find an outlet for some of my better work, since occasionally my supply of wooden items outstrips my family’s demand for them. (The wooden spoon drawer is chock full now, and my wife frowns on pipe smoking.) Second, I wanted to earn some spare cash for new tools here and there. I didn’t need a steady cash flow, but I did want to make my hobby less of a drain on the household economy. Ideally, I wanted to make my woodwork self-sustaining. As I thought about the matter and did a little more reading, I discovered that there were two simple methods that I thought a hobbyist like me could use to set reasonable prices for his or her work. Let’s say a well-to-do friend asks you to make a picture frame. You have a pretty good idea what the materials will cost, and because you’ve done some work like this before, you have a ballpark idea of how long it will take you to complete the project from start to finish. Very well. What is the going wage for skilled labor in your neck of the woods? What would you expect, say, an electrician, a plumber, or a welder to make per hour? Multiply a reasonable hourly rate for skilled labor by the number of hours you take on the project, add the materials cost, and you have a reasonable price to ask for the picture frame. This is not a foolproof method, and there can be hidden variables, such as wear-and-tear on your tools (do you charge extra if you break a bandsaw blade in the process? ), availability of materials (do you charge for materials you already have left over from another project? ), and the wait-time between coats of finish. But the equation may help you establish a base price for your work. This method is simple, but I chose not to use it. First, my materials are sometimes scavenged rather than purchased, and it is hard for me to clock myself in the shop. So I did what I normally do when in a bind: I did more research. 2. Look at prices for comparable products in your market. What worked for me was taking an honest look at what other people were charging for work that I thought was similar to mine. I looked at a lot of price tags, both in person and online. I did not bother looking at prices on mass-produced items, nor did I look at prices on items sold by major retailers. They don’t sell to my market. I went to craft fairs, gift shops at craft villages, and websites like Etsy where I could see items being sold by small, independent makers to customers who are willing to pay a premium for unique, high-quality items. Naturally, I saw a few prices online that I thought were either embarrassingly low or fantastically high, but I also saw a lot of price tags that tended to clump around a narrow price range. That gave me a pretty firm idea of where my work fit into the market. So I settled on prices that were just a little bit below what I honestly thought were comparable products on the market. This has worked reasonably well for me. The products sell at a rate I can keep up with, and they remain affordable for regular, working people who would like to spend a little extra on something handmade. A few items remain unsold, but that means I can keep a small stock of products on hand for those weeks and even months when I have little time for woodwork. Most people know the danger of setting prices too high–only a few people, if any, will purchase your work. (On the other hand, there is a certain allure to an exorbitant price tag, and some craftspeople have learned to exploit it. Customers who are not price-sensitive often assume that they are getting something extra-special just because they are paying a higher price.) Additionally, when an upstart craftsperson asks too high a price, it is likely to draw the ire of established makers: “Just who does this guy think he is, asking the same price for his entry-level work that we ask for our professional work?” If possible, I try to stay on good terms with other makers. There is an equal danger, too, in setting prices too low. Not only are you liable to have more demand than you can meet and still make little money, but you also tend to devalue your work in the eyes of your customers. In fact, too low a price can scare away potential customers:”That woodwork looks kind of nice, but it’s priced really low. There must be something wrong with it.” Plus, when you deeply undercut other makers in the market, you may ultimately drag down the price that even experienced professionals can charge. We all know about the “Walmart Effect” on local businesses, and most decent people deplore it. On balance, however, I think it’s best to err on the low side at first. If your demand increases, or if your skills really develop, you can raise your prices, and your early customers will feel like they got a bargain. But if you set prices too high and have to lower them later, your early customers may feel ripped off. There is no standard, easy method by which a hobbyist craftsperson can price his or her work. When it comes down to writing a dollar amount on a price tag, the difference between $24.99 and $27.49 may be arbitrary. But the way you decide between charging $20 for one piece and $200 for another is not. There are simple ways for hobbyists to set reasonable prices for their work, but they are not the calculations that the professionals use. This entry was posted in Musings and tagged business, calculations, etsy, overhead, price tag, prices, setting prices. Bookmark the permalink. I find that I have more or less entered the same situation that you describe. A friend of mine asked if I could make some rustic looking tables and benches for a model air plane club which he is a member of. I had pretty free hands regarding the design, so I made a nice table that wasn’t too complicated, and I timed every bit of the work I did on the table. Adding up the time, I had used a total of 6 hours and 20 minutes for the table. I multiplied the time with a sum that I found appropriate and added the sum of the materials. I have now been asked to build another table of a design which I have never tried before. I have given an estimate based roughly on how fast I think I can do it, and I will add the sum for materials as well. I think it is OK to charge for materials even if it is something that you have on hand, after all you have purchased it at some point. Timing myself when I work actually makes me more efficient. I know that I am working for someone else, so I can’t waste their money by procrastinating or doing other things. If I go to the house for a cup of tea, I stop the watch and start it again once I have finished. If I were to prize smaller items, I think that I would use your method as well, but for those projects the time system works fine for me. Another thing I find is difficult is to convince myself that not everyone actually can build the thing I am building. So it is OK to charge something more than the materials cost. Yes, amateurs undercutting professionals is a problem in many areas. It’s certainly a problem I have to face: to what extent do I look out for my own well-being, and to what extent do I look out for the well-being of people who are both colleagues and competitors? I do not like to think of it as an either/or situation–what is good for the life of the craft in general should be good for those who practice it. Yet, the more I think about the economics of the arts-and-crafts, the more complicated it looks. First, my entering the market at all may prove disruptive in itself, regardless of what I charge. Then there is the problem of parity. Hand-made items are not like brands of toothpaste. They are, almost by definition, not parity products. For example, the wooden spoon I make is going to be quite different from a wooden spoon made by somebody else, so the prices that, say, Peter Folllansbee or Robin Wood charge for their spoons aren’t necessarily the best prices for my work. (They don’t charge the same prices, either.) I’m not as good as they are, and they use different methods and produce work with a very different aesthetic from mine. They also have name-recognition, which I don’t. I’m not sure we’re even selling to the same market.